I consider this the redressing of an already addressed elephant in the room. 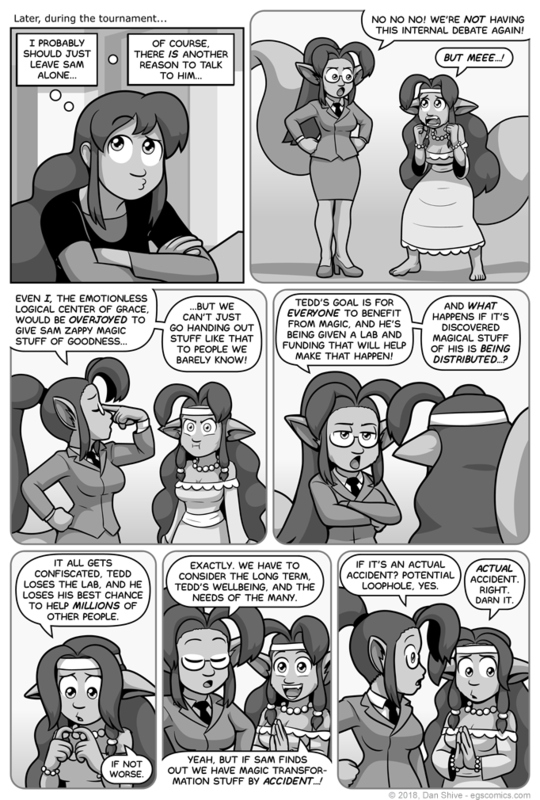 Of course, it IS relevant to the current story, the situation has evolved a bit since magic not-changed and Tedd was offered a lab, and the fact that the whole "why they're not sharing magic more" has been addressed before means this gets to be one page instead of five or something. Fun fact: The "zappy magic stuff of goodness" part was originally just "zappy magic stuff". The word "stuff" on its own at the bottom of the balloon looked awkward, however, and I figured "this is Grace. Just add more words".